This course is specially designed to adapt to your need. 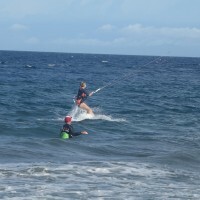 You're willing to learn how to kite, we are ready to teach you! Over four sessions of 3 to 4 hours, you will have the possibility to progress at your own rhythm. How to rig the kite equipment. Self-rescue. How to pack down the kite in the water and come back. The beach is just for launching and landing. The beach is just an odd memomy. This course is for a duration of 12 to 16 hours. The cost is 19000 Php. This price includes all the kitesurfing material, harness. Going to the Sandbar is like leaving a dream day. With an early departure (around 6:30) and a late afternoon return, this will give you a lot to remember. This place is only known by a few, but the wind is consistant during Amihan and you'll get to ride in one of the most beautiful place in the Philippines. Pristine flat water, strong wind... what else. Possibility to work on a discount for a group or if you bring your own equipment. Get your gears and go to ride! Don't worry about bringing your cumbersome quiver all around the world, we have the exact kite for the wind!! The wind picks up? switch to a small kite! If it drops in the afternoon, how about riding a bigger board and a big kite. No problem, we manage! You're not sur you'll last that long? You have a plane to catch? You can rent equipment per hour. No worry about overtime, if you've decided to extend you session, you'll switch to the rent per day rate. 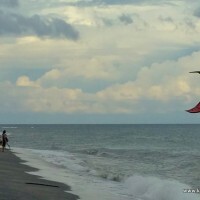 Welcome to Kite In Negros, the only kitesurfing school in Negros. The school is based near Dumaguete, in one of the windiest area of the Philippines, where a permanent breeze is blowing, due to natural relief. It is not a well-renowned spot yet, but it will become. 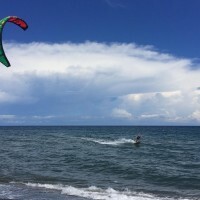 The regularity of the wind and the absence of obstruction create a perfect location for kitesurfing and other water sports. Our school is equipped with the best and latest equipment available in the area. Equipment is renewed regularly so to offer the safest and most enjoyable experience for the students to learn how to harness the wind. 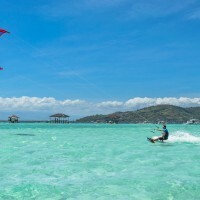 Negros is mostly a place known for its fabulous diving, but still remains a hidden gem when it comes to water sports. 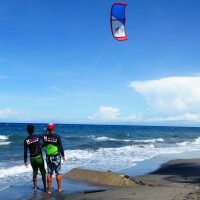 Zamboanguita (do not confuse with Zamboanga) is the best place in Negros to learn kitesurfing. It is very near to Dumaguete, so it is easily accessible from other big towns in the Philippines. With its orientation, the wide beach gives safety for the beginners and a well-exposed flat bay for the advanced kitesurfers. That’s the reason why Kite In Negros set-up a center in Zamboanguita. Having the possibility to ride from sunrise till the wind dies, at your doorstep, in the comfort of this immaculate resort will provide a unique experience to any sea lovers.